1 A None No Power Seat 1 A is a Premium Rouge seat that has limited legroom. There is no floor storage for this seat during take-off and landing. 1 C None No Power Seat 1 C is a Premium Rouge seat that has limited legroom. There is no floor storage for this seat during take-off and landing. 1 D None No Power Seat 1 D is a Premium Rouge seat that has limited legroom. There is no floor storage for this seat during take-off and landing. 1 F None No Power Seat 1 F is a Premium Rouge seat that has limited legroom. There is no floor storage for this seat during take-off and landing. 1 H None No Power Seat 1 H is a Premium Rouge seat that has limited legroom. There is no floor storage for this seat during take-off and landing. 1 K None No Power Seat 1 K is a Premium Rouge seat that has limited legroom. There is no floor storage for this seat during take-off and landing. 12 A None No Power Seat 12 A is a Rouge Plus Seat that has restricted legroom due to the position of the bulkhead. An extra surcharge must be paid to reserve this seat. The tray table is in the armrest, making the armrest immovable and slightly reducing seat width. Passengers traveling with infants are also often seated in this row. 12 C None No Power Seat 12 C is a Rouge Plus Seat that has restricted legroom due to the position of the bulkhead. An extra surcharge must be paid to reserve this seat. The tray table is in the armrest, making the armrest immovable and slightly reducing seat width. Passengers traveling with infants are also often seated in this row. 12 D None No Power Seat 12 D is a Rouge Plus Seat that has restricted legroom due to the position of the bulkhead. An extra surcharge must be paid to reserve this seat. The tray table is in the armrest, making the armrest immovable and slightly reducing seat width. Passengers traveling with infants are also often seated in this row. 12 E None No Power Seat 12 E is a Rouge Plus Seat that has restricted legroom due to the position of the bulkhead. An extra surcharge must be paid to reserve this seat. The tray table is in the armrest, making the armrest immovable and slightly reducing seat width. Passengers traveling with infants are also often seated in this row. 12 F None No Power Seat 12 F is a Rouge Plus Seat that has restricted legroom due to the position of the bulkhead. An extra surcharge must be paid to reserve this seat. The tray table is in the armrest, making the armrest immovable and slightly reducing seat width. Passengers traveling with infants are also often seated in this row. 12 H None No Power Seat 12 H is a Rouge Plus Seat that has restricted legroom due to the position of the bulkhead. An extra surcharge must be paid to reserve this seat. The tray table is in the armrest, making the armrest immovable and slightly reducing seat width. Passengers traveling with infants are also often seated in this row. 12 K None No Power Seat 12 K is a Rouge Plus Seat that has restricted legroom due to the position of the bulkhead. An extra surcharge must be paid to reserve this seat. The tray table is in the armrest, making the armrest immovable and slightly reducing seat width. Passengers traveling with infants are also often seated in this row. 13 A None No Power Seat 13 A is a standard Rouge Plus seat. 13 C None No Power Seat 13 C is a Rouge Plus seat where legroom may be restricted due to the presence of an entertainment equipment box. 13 D None No Power Seat 13 D is a standard Rouge Plus seat. 13 E None No Power Seat 13 E is a standard Rouge Plus seat. 13 F None No Power Seat 13 F is a standard Rouge Plus seat. 13 H None No Power Seat 13 H is a Rouge Plus seat where legroom may be restricted due to the presence of an entertainment equipment box. 13 K None No Power Seat 13 K is a standard Rouge Plus seat. 14 A None No Power Seat 14 A is a standard Rouge Plus seat. 14 C None No Power Seat 14 C is a Rouge Plus seat where legroom may be restricted due to the presence of an entertainment equipment box. 14 D None No Power Seat 14 D is a standard Rouge Plus seat. 14 E None No Power Seat 14 E is a standard Rouge Plus seat. 14 F None No Power Seat 14 F is a standard Rouge Plus seat. 14 H None No Power Seat 14 H is a Rouge Plus seat where legroom may be restricted due to the presence of an entertainment equipment box. 14 K None No Power Seat 14 K is a standard Rouge Plus seat. 15 A None No Power Seat 15 A is a standard Rouge Plus seat. 15 C None No Power Seat 15 C is a Rouge Plus seat where legroom may be restricted due to the presence of an entertainment equipment box. 15 D None No Power Seat 15 D is a standard Rouge Plus seat. 15 E None No Power Seat 15 E is a standard Rouge Plus seat. 15 F None No Power Seat 15 F is a standard Rouge Plus seat. 15 H None No Power Seat 15 H is a Rouge Plus seat where legroom may be restricted due to the presence of an entertainment equipment box. 15 K None No Power Seat 15 K is a standard Rouge Plus seat. 18 A None No Power Seat 18 A is a standard Rouge Economy seat. 18 C None No Power Seat 18 C is a Rouge Economy seat where legroom may be restricted due to the presence of an entertainment equipment box. 18 D None No Power Seat 18 D is a standard Rouge Economy seat. 18 E None No Power Seat 18 E is a standard Rouge Economy seat. 18 F None No Power Seat 18 F is a standard Rouge Economy seat. 18 H None No Power Seat 18 H is a Rouge Economy seat where legroom may be restricted due to the presence of an entertainment equipment box. 18 K None No Power Seat 18 K is a standard Rouge Economy seat. 19 A None No Power Seat 19 A is a standard Rouge Economy seat. 19 C None No Power Seat 19 C is a Rouge Economy seat where legroom may be restricted due to the presence of an entertainment equipment box. 19 D None No Power Seat 19 D is a standard Rouge Economy seat. 19 E None No Power Seat 19 E is a standard Rouge Economy seat. 19 F None No Power Seat 19 F is a standard Rouge Economy seat. 19 H None No Power Seat 19 H is a Rouge Economy seat where legroom may be restricted due to the presence of an entertainment equipment box. 19 K None No Power Seat 19 K is a standard Rouge Economy seat. 2 A None No Power Seat 2 A is a Premium Rouge seat. 2 C None No Power Seat 2 C is a Premium Rouge seat. 2 D None No Power Seat 2 D is a Premium Rouge seat. 2 F None No Power Seat 2 F is a Premium Rouge seat. 2 H None No Power Seat 2 H is a Premium Rouge seat. 2 K None No Power Seat 2 K is a Premium Rouge seat. 20 A None No Power Seat 20 A is a standard Rouge Economy seat. 20 C None No Power Seat 20 C is a Rouge Economy seat where legroom may be restricted due to the presence of an entertainment equipment box. 20 D None No Power Seat 20 D is a standard Rouge Economy seat. 20 E None No Power Seat 20 E is a standard Rouge Economy seat. 20 F None No Power Seat 20 F is a standard Rouge Economy seat. 20 H None No Power Seat 20 H is a Rouge Economy seat where legroom may be restricted due to the presence of an entertainment equipment box. 20 K None No Power Seat 20 K is a standard Rouge Economy seat. 21 A None No Power Seat 21 A is a standard Rouge Economy seat, however, it is missing a window. 21 C None No Power Seat 21 C is a Rouge Economy seat where legroom may be restricted due to the presence of an entertainment equipment box. 21 D None No Power Seat 21 D is a standard Rouge Economy seat. 21 E None No Power Seat 21 E is a standard Rouge Economy seat. 21 F None No Power Seat 21 F is a standard Rouge Economy seat. 21 H None No Power Seat 21 H is a Rouge Economy seat where legroom may be restricted due to the presence of an entertainment equipment box. 21 K None No Power Seat 21 K is a standard Rouge Economy seat, however, it is missing a window. 22 A None No Power Seat 22 A is a standard Rouge Economy seat. 22 C None No Power Seat 22 C is a Rouge Economy seat where legroom may be restricted due to the presence of an entertainment equipment box. 22 D None No Power Seat 22 D is a standard Rouge Economy seat. 22 E None No Power Seat 22 E is a standard Rouge Economy seat. 22 F None No Power Seat 22 F is a standard Rouge Economy seat. 22 H None No Power Seat 22 H is a Rouge Economy seat where legroom may be restricted due to the presence of an entertainment equipment box. 22 K None No Power Seat 22 K is a standard Rouge Economy seat. 23 A None No Power Seat 23 A is a standard Rouge Economy seat, however, it is missing a window. 23 C None No Power Seat 23 C is a Rouge Economy seat where legroom may be restricted due to the presence of an entertainment equipment box. 23 D None No Power Seat 23 D is a standard Rouge Economy seat. 23 E None No Power Seat 23 E is a standard Rouge Economy seat. 23 F None No Power Seat 23 F is a standard Rouge Economy seat. 23 H None No Power Seat 23 H is a Rouge Economy seat where legroom may be restricted due to the presence of an entertainment equipment box. 23 K None No Power Seat 23 K is a standard Rouge Economy seat, however, it is missing a window. 24 A None No Power Seat 24 A is a standard Rouge Economy seat. 24 C None No Power Seat 24 C is a Rouge Economy seat where legroom may be restricted due to the presence of an entertainment equipment box. 24 D None No Power Seat 24 D is a standard Rouge Economy seat. 24 E None No Power Seat 24 E is a standard Rouge Economy seat. 24 F None No Power Seat 24 F is a standard Rouge Economy seat. 24 H None No Power Seat 24 H is a standard Rouge Economy seat. 24 K None No Power Seat 24 K is a standard Rouge Economy seat. 25 A None No Power Seat 25 A is a standard Rouge Economy seat. 25 C None No Power Seat 25 C is a Rouge Economy seat where legroom may be restricted due to the presence of an entertainment equipment box. 25 D None No Power Seat 25 D is a standard Rouge Economy seat. 25 E None No Power Seat 25 E is a standard Rouge Economy seat. 25 F None No Power Seat 25 F is a standard Rouge Economy seat. 25 H None No Power Seat 25 H is a Rouge Economy seat where legroom may be restricted due to the presence of an entertainment equipment box. 25 K None No Power Seat 25 K is a standard Rouge Economy seat. 26 A None No Power Seat 26 A is a Rouge Economy seat that does not recline and whose close proximity to the lavatories may be bothersome. 26 C None No Power Seat 26 C is a Rouge Economy seat that does not recline and whose close proximity to the lavatories may be bothersome. Legroom may be restricted due to the presence of an entertainment equipment box. 26 D None No Power Seat 26 D is a Rouge Economy seat that does not recline and whose close proximity to the lavatories may be bothersome. 26 E None No Power Seat 26 E is a Rouge Economy seat that does not recline and whose close proximity to the lavatories may be bothersome. 26 F None No Power Seat 26 F is a Rouge Economy seat that does not recline and whose close proximity to the lavatories may be bothersome. 26 H None No Power Seat 26 H is a Rouge Economy seat that does not recline and whose close proximity to the lavatories may be bothersome. Legroom may be restricted due to the presence of an entertainment equipment box. 26 K None No Power Seat 26 K is a Rouge Economy seat that does not recline and whose close proximity to the lavatories may be bothersome. 27 A None No Power Seat 27 A is an exit row seat and may have limited recline. The proximity to the main lavatories may be bothersome as passengers often congregate in this area while waiting to use the lavatory. The tray table is in the armrest, making the armrest immovable and slightly reducing seat width. 27 C None No Power Seat 27 C is an Rouge Economy Exit Row seat and may have limited recline. Legroom may be restricted due to the presence of an entertainment equipment box. The close proximity to the main lavatories may be bothersome as passengers often congregate in this area while waiting to use the lavatory. The tray table is in the armrest, making the armrest immovable and slightly reducing seat width. 27 D None No Power Seat 27 D is a Rouge Plus Seat. An extra surcharge must be paid to reserve this seat. This seat has two additional inches of recline and five extra inches of seat pitch compared with Rouge Economy class. However, there is a small bulkhead partition above this seat which may be bothersome. The tray table is in the armrest, making the armrest immovable and slightly reducing seat width. Passengers traveling with infants are also often seated in this row. 27 E None No Power Seat 27 E is a Rouge Plus Seat. An extra surcharge must be paid to reserve this seat. This seat has two additional inches of recline and five extra inches of seat pitch compared with Rouge Economy class. However, there is a small bulkhead partition above this seat which may be bothersome. The tray table is in the armrest, making the armrest immovable and slightly reducing seat width. Passengers traveling with infants are also often seated in this row. 27 F None No Power Seat 27 F is a Rouge Plus Seat. An extra surcharge must be paid to reserve this seat. This seat has two additional inches of recline and five extra inches of seat pitch compared with Rouge Economy class. However, there is a small bulkhead partition above this seat which may be bothersome. The tray table is in the armrest, making the armrest immovable and slightly reducing seat width. Passengers traveling with infants are also often seated in this row. 27 H None No Power Seat 27 H is an Rouge Economy Exit Row seat and may have limited recline. Legroom may be restricted due to the presence of an entertainment equipment box. The close proximity to the main lavatories may be bothersome as passengers often congregate in this area while waiting to use the lavatory. The tray table is in the armrest, making the armrest immovable and slightly reducing seat width. 27 K None No Power Seat 27 K is an exit row seat and may have limited recline. The proximity to the main lavatories may be bothersome as passengers often congregate in this area while waiting to use the lavatory. The tray table is in the armrest, making the armrest immovable and slightly reducing seat width. 28 A None No Power Seat 28 A is a Rouge Plus Seat. An extra surcharge must be paid to reserve this seat. This seat has two additional inches of recline and five extra inches of seat pitch compared with Rouge Economy class. However, some of this space may be limited due to a protrusion of the exit door. There is no window-side armrest and the window is misaligned. Passengers have reported that there is no overhead luggage space for this seat as the life rafts are above; and the Exit Door is not insulated, which results in this area becoming cold. 28 C None No Power Seat 28 C is a Rouge Plus Seat. An extra surcharge must be paid to reserve this seat. This seat has two additional inches of recline and five extra inches of seat pitch compared with Rouge Economy class. Passengers have reported that there is no overhead luggage space for this seat as the life rafts are above; and the Exit Door is not insulated, which results in this area becoming cold. 28 D None No Power Seat 28 D is a standard Rouge Economy seat. 28 E None No Power Seat 28 E is a standard Rouge Economy seat. 28 F None No Power Seat 28 F is a standard Rouge Economy seat. 28 H None No Power Seat 28 H is a Rouge Plus Seat. An extra surcharge must be paid to reserve this seat. This seat has two additional inches of recline and five extra inches of seat pitch compared with Rouge Economy class. Passengers have reported that there is no overhead luggage space for this seat as the life rafts are above; and the Exit Door is not insulated, which results in this area becoming cold. 28 K None No Power Seat 28 K is a Rouge Plus Seat. An extra surcharge must be paid to reserve this seat. This seat has two additional inches of recline and five extra inches of seat pitch compared with Rouge Economy class. However, some of this space may be limited due to a protrusion of the exit door. There is no window-side armrest and the window is misaligned. Passengers have reported that there is no overhead luggage space for this seat as the life rafts are above; and the Exit Door is not insulated, which results in this area becoming cold. 29 A None No Power Seat 29 A is a standard Rouge Economy seat. There is no overhead storage due to airline equipment being stored here. 29 C None No Power Seat 29 C is a Rouge Economy seat where legroom may be restricted due to the presence of an entertainment equipment box. There is no overhead storage due to airline equipment being stored here. 29 D None No Power Seat 29 D is a standard Rouge Economy seat. 29 E None No Power Seat 29 E is a standard Rouge Economy seat. 29 F None No Power Seat 29 F is a standard Rouge Economy seat. 29 H None No Power Seat 29 H is a Rouge Economy seat where legroom may be restricted due to the presence of an entertainment equipment box. There is no overhead storage due to airline equipment being stored here. 29 K None No Power Seat 29 K is a standard Rouge Economy seat. There is no overhead storage due to airline equipment being stored here. 3 A None No Power Seat 3 A is a Premium Rouge seat. 3 C None No Power Seat 3 C is a Premium Rouge seat. 3 D None No Power Seat 3 D is a Premium Rouge seat. 3 F None No Power Seat 3 F is a Premium Rouge seat. 3 H None No Power Seat 3 H is a Premium Rouge seat. 3 K None No Power Seat 3 K is a Premium Rouge seat. 30 A None No Power Seat 30 A is a standard Rouge Economy seat. There is no overhead storage due to airline equipment being stored here. 30 C None No Power Seat 30 C is a Rouge Economy seat where legroom may be restricted due to the presence of an entertainment equipment box. There is no overhead storage due to airline equipment being stored here. 30 D None No Power Seat 30 D is a standard Rouge Economy seat. 30 E None No Power Seat 30 E is a standard Rouge Economy seat. 30 F None No Power Seat 30 F is a standard Rouge Economy seat. 30 H None No Power Seat 30 H is a Rouge Economy seat where legroom may be restricted due to the presence of an entertainment equipment box. There is no overhead storage due to airline equipment being stored here. 30 K None No Power Seat 30 K is a standard Rouge Economy seat. There is no overhead storage due to airline equipment being stored here. 31 A None No Power Seat 31 A is a standard Rouge Economy seat. 31 C None No Power Seat 31 C is a Rouge Economy seat where legroom may be restricted due to the presence of an entertainment equipment box. 31 D None No Power Seat 31 D is a standard Rouge Economy seat. 31 E None No Power Seat 31 E is a standard Rouge Economy seat. 31 F None No Power Seat 31 F is a standard Rouge Economy seat. 31 H None No Power Seat 31 H is a Rouge Economy seat where legroom may be restricted due to the presence of an entertainment equipment box. 31 K None No Power Seat 31 K is a standard Rouge Economy seat. 32 A None No Power Seat 32 A is a standard Rouge Economy seat. 32 C None No Power Seat 32 C is a Rouge Economy seat where legroom may be restricted due to the presence of an entertainment equipment box. 32 D None No Power Seat 32 D is a standard Rouge Economy seat. 32 E None No Power Seat 32 E is a standard Rouge Economy seat. 32 F None No Power Seat 32 F is a standard Rouge Economy seat. 32 H None No Power Seat 32 H is a Rouge Economy seat where legroom may be restricted due to the presence of an entertainment equipment box. 32 K None No Power Seat 32 K is a standard Rouge Economy seat. 33 A None No Power Seat 33 A is a standard Rouge Economy seat. 33 C None No Power Seat 33 C is a Rouge Economy seat where legroom may be restricted due to the presence of an entertainment equipment box. 33 D None No Power Seat 33 D is a standard Rouge Economy seat. 33 E None No Power Seat 33 E is a standard Rouge Economy seat. 33 F None No Power Seat 33 F is a standard Rouge Economy seat. 33 H None No Power Seat 33 H is a Rouge Economy seat where legroom may be restricted due to the presence of an entertainment equipment box. 33 K None No Power Seat 33 K is a standard Rouge Economy seat. 34 A None No Power Seat 34 A is a standard Rouge Economy seat. 34 C None No Power Seat 34 C is a Rouge Economy seat where legroom may be restricted due to the presence of an entertainment equipment box. 34 D None No Power Seat 34 D is a standard Rouge Economy seat. 34 E None No Power Seat 34 E is a standard Rouge Economy seat. 34 F None No Power Seat 34 F is a standard Rouge Economy seat. 34 H None No Power Seat 34 H is a Rouge Economy seat where legroom may be restricted due to the presence of an entertainment equipment box. 34 K None No Power Seat 34 K is a standard Rouge Economy seat. 35 A None No Power Seat 35 A is a standard Rouge Economy seat. 35 C None No Power Seat 35 C is a Rouge Economy seat where legroom may be restricted due to the presence of an entertainment equipment box. 35 D None No Power Seat 35 D is a standard Rouge Economy seat. 35 E None No Power Seat 35 E is a standard Rouge Economy seat. 35 F None No Power Seat 35 F is a standard Rouge Economy seat. 35 H None No Power Seat 35 H is a Rouge Economy seat where legroom may be restricted due to the presence of an entertainment equipment box. 35 K None No Power Seat 35 K is a standard Rouge Economy seat. 36 A None No Power Seat 36 A is a standard Rouge Economy seat. 36 C None No Power Seat 36 C is a Rouge Economy seat where legroom may be restricted due to the presence of an entertainment equipment box. 36 D None No Power Seat 36 D is a standard Rouge Economy seat. 36 E None No Power Seat 36 E is a standard Rouge Economy seat. 36 F None No Power Seat 36 F is a standard Rouge Economy seat. 36 H None No Power Seat 36 H is a Rouge Economy seat where legroom may be restricted due to the presence of an entertainment equipment box. 36 K None No Power Seat 36 K is a standard Rouge Economy seat. 37 A None No Power Seat 37 A is a standard Rouge Economy seat. 37 C None No Power Seat 37 C is a Rouge Economy seat where legroom may be restricted due to the presence of an entertainment equipment box. 37 D None No Power Seat 37 D is a standard Rouge Economy seat. 37 E None No Power Seat 37 E is a standard Rouge Economy seat. 37 F None No Power Seat 37 F is a standard Rouge Economy seat. 37 H None No Power Seat 37 H is a Rouge Economy seat where legroom may be restricted due to the presence of an entertainment equipment box. 37 K None No Power Seat 37 K is a standard Rouge Economy seat. 38 A None No Power Seat 38 A is a standard Rouge Economy seat. 38 C None No Power Seat 38 C is a Rouge Economy seat where legroom may be restricted due to the presence of an entertainment equipment box. 38 D None No Power Seat 38 D is a standard Rouge Economy seat. 38 E None No Power Seat 38 E is a standard Rouge Economy seat. 38 F None No Power Seat 38 F is a standard Rouge Economy seat. 38 H None No Power Seat 38 H is a Rouge Economy seat where legroom may be restricted due to the presence of an entertainment equipment box. 38 K None No Power Seat 38 K is a standard Rouge Economy seat. 39 A None No Power Seat 39 A is a standard Rouge Economy seat. 39 C None No Power Seat 39 C is a Rouge Economy seat where legroom may be restricted due to the presence of an entertainment equipment box. 39 D None No Power Seat 39 D is a standard Rouge Economy seat. 39 E None No Power Seat 39 E is a standard Rouge Economy seat. 39 F None No Power Seat 39 F is a standard Rouge Economy seat. 39 H None No Power Seat 39 H is a Rouge Economy seat where legroom may be restricted due to the presence of an entertainment equipment box. 39 K None No Power Seat 39 K is a standard Rouge Economy seat. 4 A None No Power Seat 4 A is a Premium Rouge seat. 4 C None No Power Seat 4 C is a Premium Rouge seat. 4 D None No Power Seat 4 D is a Premium Rouge seat. 4 F None No Power Seat 4 F is a Premium Rouge seat. 4 H None No Power Seat 4 H is a Premium Rouge seat. 4 K None No Power Seat 4 K is a Premium Rouge seat. 40 A None No Power Seat 40 A is a standard Rouge Economy seat. 40 C None No Power Seat 40 C is a Rouge Economy seat where legroom may be restricted due to the presence of an entertainment equipment box. 40 D None No Power Seat 40 D is a standard Rouge Economy seat. 40 E None No Power Seat 40 E is a standard Rouge Economy seat. 40 F None No Power Seat 40 F is a standard Rouge Economy seat. 40 H None No Power Seat 40 H is a Rouge Economy seat where legroom may be restricted due to the presence of an entertainment equipment box. 40 K None No Power Seat 40 K is a standard Rouge Economy seat. 41 A None No Power Seat 41 A is a standard Rouge Economy seat. 41 C None No Power Seat 41 C is a Rouge Economy seat where legroom may be restricted due to the presence of an entertainment equipment box. 41 D None No Power Seat 41 D is a standard Rouge Economy seat. 41 E None No Power Seat 41 E is a standard Rouge Economy seat. 41 F None No Power Seat 41 F is a standard Rouge Economy seat. 41 H None No Power Seat 41 H is a Rouge Economy seat where legroom may be restricted due to the presence of an entertainment equipment box. 41 K None No Power Seat 41 K is a standard Rouge Economy seat. 42 A None No Power Seat 42 A is a standard Rouge Economy seat. 42 C None No Power Seat 42 C is a Rouge Economy seat where legroom may be restricted due to the presence of an entertainment equipment box. 42 D None No Power Seat 42 D is a standard Rouge Economy seat. 42 E None No Power Seat 42 E is a standard Rouge Economy seat. 42 F None No Power Seat 42 F is a standard Rouge Economy seat. 42 H None No Power Seat 42 H is a Rouge Economy seat where legroom may be restricted due to the presence of an entertainment equipment box. 42 K None No Power Seat 42 K is a standard Rouge Economy seat. 43 A None No Power Seat 43 A is a standard Rouge Economy seat. 43 C None No Power Seat 43 C is a Rouge Economy seat where legroom may be restricted due to the presence of an entertainment equipment box. 43 D None No Power Seat 43 D is a standard Rouge Economy seat. 43 E None No Power Seat 43 E is a standard Rouge Economy seat. 43 F None No Power Seat 43 F is a standard Rouge Economy seat. 43 H None No Power Seat 43 H is a Rouge Economy seat where legroom may be restricted due to the presence of an entertainment equipment box. 43 K None No Power Seat 43 K is a standard Rouge Economy seat. 44 A None No Power Seat 44 A is a standard Rouge Economy seat. 44 C None No Power Seat 44 C is a Rouge Economy seat where legroom may be restricted due to the presence of an entertainment equipment box. 44 D None No Power Seat 44 D is a standard Rouge Economy seat. 44 E None No Power Seat 44 E is a standard Rouge Economy seat. 44 F None No Power Seat 44 F is a standard Rouge Economy seat. 44 H None No Power Seat 44 H is a Rouge Economy seat where legroom may be restricted due to the presence of an entertainment equipment box. 44 K None No Power Seat 44 K is a standard Rouge Economy seat. 45 A None No Power Seat 45 A is a standard Rouge Economy seat. 45 C None No Power Seat 45 C is a Rouge Economy seat where legroom may be restricted due to the presence of an entertainment equipment box. 45 D None No Power Seat 45 D is a standard Rouge Economy seat. 45 E None No Power Seat 45 E is a standard Rouge Economy seat. 45 F None No Power Seat 45 F is a standard Rouge Economy seat. 45 H None No Power Seat 45 H is a Rouge Economy seat where legroom may be restricted due to the presence of an entertainment equipment box. 45 K None No Power Seat 45 K is a standard Rouge Economy seat. 46 A None No Power Seat 46 A is a standard Rouge Economy seat. 46 C None No Power Seat 46 C is a Rouge Economy seat where legroom may be restricted due to the presence of an entertainment equipment box. 46 D None No Power Seat 46 D is a standard Rouge Economy seat. 46 E None No Power Seat 46 E is a standard Rouge Economy seat. 46 F None No Power Seat 46 F is a standard Rouge Economy seat. 46 H None No Power Seat 46 H is a Rouge Economy seat where legroom may be restricted due to the presence of an entertainment equipment box. 46 K None No Power Seat 46 K is a standard Rouge Economy seat. 47 A None No Power Seat 47 A is a standard Rouge Economy seat. 47 C None No Power Seat 47 C is a Rouge Economy seat where legroom may be restricted due to the presence of an entertainment equipment box. 47 D None No Power Seat 47 D is a standard Rouge Economy seat. 47 E None No Power Seat 47 E is a standard Rouge Economy seat. 47 F None No Power Seat 47 F is a standard Rouge Economy seat. 47 H None No Power Seat 47 H is a Rouge Economy seat where legroom may be restricted due to the presence of an entertainment equipment box. 47 K None No Power Seat 47 K is a standard Rouge Economy seat. 48 A None No Power Seat 48 A is a standard Rouge Economy seat. 48 C None No Power Seat 48 C is a Rouge Economy seat where legroom may be restricted due to the presence of an entertainment equipment box. 48 D None No Power Seat 48 D is a standard Rouge Economy seat. 48 E None No Power Seat 48 E is a standard Rouge Economy seat. 48 F None No Power Seat 48 F is a standard Rouge Economy seat. 48 H None No Power Seat 48 H is a Rouge Economy seat where legroom may be restricted due to the presence of an entertainment equipment box. 48 K None No Power Seat 48 K is a standard Rouge Economy seat. 49 A None No Power Seat 49 A is in the last row of Rouge Economy class and may have limited recline. The proximity to the lavatories may be bothersome. 49 C None No Power Seat 49 C is in the last row of Rouge Economy class and may have limited recline. Legroom may be restricted due to the presence of an entertainment equipment box. The close proximity to the lavatories may be bothersome. 49 D None No Power Seat 49 D is a standard Rouge Economy however, the proximity to the lavatories may be bothersome. 49 E None No Power Seat 49 E is a standard Rouge Economy seat. 49 F None No Power Seat 49 F is a standard Rouge Economy however, the proximity to the lavatories may be bothersome. 49 H None No Power Seat 49 H is in the last row of Rouge Economy class and may have limited recline. Legroom may be restricted due to the presence of an entertainment equipment box. The close proximity to the lavatories may be bothersome. 49 K None No Power Seat 49 K is in the last row of Rouge Economy class and may have limited recline. The proximity to the lavatories may be bothersome. 50 D None No Power Seat 50 D is Rouge Economy class seat that may have limited recline. The proximity to the lavatories may be bothersome. 50 E None No Power Seat 50 E is Rouge Economy class seat that may have limited recline. The proximity to the lavatories may be bothersome. 50 F None No Power Seat 50 F is Rouge Economy class seat that may have limited recline. The proximity to the lavatories may be bothersome. 51 D None No Power Seat 51 D is in the last row of Rouge Economy class and may have limited recline. The proximity to the lavatories may be bothersome. 51 E None No Power Seat 51 E is in the last row of Rouge Economy class and may have limited recline. The proximity to the lavatories may be bothersome. 51 F None No Power Seat 51 F is in the last row of Rouge Economy class and may have limited recline. The proximity to the lavatories may be bothersome. Air Canada Rouge provides wireless streaming of music to passenger's electronic devices (PEDs) such as laptops, tablets or smartphones with iPads also available to rent. Air Canada Rouge provides wireless streaming of movies, TV shows, and music to passenger's electronic devices (PEDs) such as laptops, tablets or smartphones. This service is available available for a fee of $5-10. All Premium Rouge seats have access to an individual power port. Rouge and Rouge Plus seats share power ports between seats. On flights to the Caribbean, complimentary non-alcoholic beverages will be offered to all passengers as well as delicious Buy On Board menu featuring hot and cold meals and snacks as well as alcoholic beverages. On flights to Europe, rouge and rouge Plus customers will enjoy a complimentary hot meal with a full selection of non-alcoholic and alcoholic beverages. Premium rouge customers will be delighted with exeptional food and beverage served on find dishware and glassware. Hot towels, snacks, exquisitely-prepared meals, and carefully selected wines provide for an unforgettable experience for Premium rouge customers. Air Canada rouge is the new leisure airline from Air Canada. This aircraft is used on routes to Edinburgh, Venice, Athens, and other destinations in Europe. This 767 aircraft features next generation wireless streaming of entertainment content to passenger laptops, tablets, or smartphones with iPads available to rent. As someone who mostly flies in domestic First and International Business, I flew economy on this 767 and don't know what everyone is complaining about. Have these people been on a United widebody or seen Doug Parker's American Airlines new hell plane, their 737MAX? This plane is a widebody 7 across, the seats are plenty wide, and even with the person in front of me fully reclined, I could still comfortably use my laptop. Flew 5 hrs YYZ-PVR in this bird; flight attendants couldn't have been nicer, food for purchase was good, and the seat was totally comfortable. The plane is clearly old - overhead storage is a bit unusual, but with these planes going to leisure destinations, overhead space really didn't get even close to full. I would very happy fly Rouge again on a 767 in the future. Having seen the "premium" product 6 across up front, I don't regret not paying extra for it. Seat 12D does have more leg room but the arm rest on the right side of the seat is actually moveable -- unlike what is noted on your seat map. This makes the seat feel wider than it is. Also, if no one sits next to you, you can move the armrest up so that you can spread out into both seats. This seat is actually a good option for those who are willing to pay for the extra room and want to be near the front of the plane. AC Rouge YYZ-BCN, premium economy. Budget airline at premium prices. Cabin crew were great, friendly, attentive, drinks flowed freely. Typical airline food, expected better in this class tbh. Free iPads, mine froze up once we were airborne. Seats don't recline nearly as much as I expected, maybe 6 inches, and minimal legroom due to bulkhead in this row. Choose any other row in this class or better yet get some strong sleeping pills, fly regular economy and save your money. Only sleep can reduce the misery of AC "Rogue." First experience with AC Rouge YYZ-BCN, round trip. To BCN I sat in 3D. The seat was a smaller version of typical domestic first class. It was comfortable enough sitting awake, but sleeping wasn't really an option. There was hardly any underseat space for personal items due to a (useless) foot rest. The food served in the "premium" cabin was the worst I can remember. The flight attendants were very nice, though. The seat back entertainment is an ipad with very limited options. Return to YYZ, I sat in 15D (paid $100 for the extra legroom). I actually preferred this seat to the "premium" 3D. There was more leg room and plenty of underseat storage for my personal items. Food was also better in the economy cabin. The was no entertainment whatsoever, so be aware to bring your own. I checked the basic economy seats, and they were very cramped. If flying Rouge, the extra legroom is a must. $100 for a 9 hour flight was well worth it! This Rouge Plus seat offers more legroom that the rest of the sardine can also known as a Rouge A319 but the seat itself is narrow and uncomfortable. I usually try to avoid Rouge at all costs but unfortunately on this trip, we were taking a cruise and needed direct flights. Flying Premium Rouge is the only way to tolerate this garbage from Air Canada. While the seats are essentially standard business recliners, there is less legroom than on mainline business class. I flew on 28A from YYZ to BUD on 09/08 and back in 28K on 09/17. Row 28 is good, definitely has the legroom going for it. I did not feel the plane was all that cold, cool at best. Worst part is the proximity to the lavoratories. 28K is better because the door opens toward 28A and the light is constantly in your eyes. There are also nonstop bells going off that the flight attendants use which makes sleep nearly impossible. I had no seatmate on either leg, but on the outbound flight the guy in row 27 asked the flight attendant, who allowed him to move and sit next to me. This made the flight much more miserable than it would have been. Seems to me you should have to stay in your assigned seat, or at least ask the person you are going to inconvenience if they mind. Order a special meal - no extra cost and you get served first. At 5'9"/150lbs I was still cramped in this really, REALLY11 hard seat for 7+hrs. Bring cushions and duvet 'cos you're in for a hard ,cold ride. Much easier to travel with another carrier... ANY OTHER carrier. Easily my worst flight in more than 40 years. Don't do this to yourself. Lots to be aware of in economy class on these Rouge flights to Europe. If you're a taller person like me, go in expecting to get zero hours sleep. Seat pitch is very poor, legroom is poor - nowhere near what should be provided on a 9 hour flight. As a result you will be constantly disturbed by those behind you. BYO entertainment as there is none provided. Each pair of seats shares a power plug so you can still charge your tablet/laptop. Air Canada clearly employ the B-team on these flights - staff had zero control of the dozen old people who disregarded the safety belt signs - but as soon as I (a person younger than retirement age) got up to get something out of my bag I got yelled at. Pathetic. Flew from Toronto to Prague on Air Canada Rouge during the World Cup (June 2018). Seat 28H was such a good choice; I was wearing a jacket but I would tend to agree that it might get a little bit cold. Excellent legroom for a 6'2" guy; no trouble stretching my legs underneath the seat in front of me. There is a power outlet in between 28H and 28K so be quick to grab it :) A few cons: 28H is just a few feet away from the lavatories so after a while you might feel the effects of the stink-fest through your nose. Lastly, a lot of people will use the corridor that connects both wings to stretch and chat among themselves. So you might have a hard time trying to sleep peacefully. On the other hand, you can stand up and take a couple of steps and stretch your limbs yourself. No overhead storage above you; be quick to grab the nearest compartment! Note: This plane is super old so power up your tablet/phone/iPod to provide your own entertainment. The review for 28H & 28K says that the exit door is not insulated and seat is cold. There is no way to overstate how cold this seat is. I would suggest saying that this seat "can be frigid" and suggest passengers wear multiple layers of clothing. I would also suggest making the colour of this seat just yellow just like the seats in front of it. I paid for extra leg room on outbound and inbound seat 27A both ways. On boarding to go to Toronto I couldn't stretch my legs because I was up against the toilet wall and I'm only 5' 6" tall. I took pictures. The stewardess said I could move to any seat at the back of the aircraft so I did. For the home journey I cancelled the 27A seat for a standard and I had room to stretch out. They refunded that seat but be aware that air canada dont want to give you a refund after you've flown (even with photos) I am now spending a lot of time trying to get my money back for the outgoing 27A seat. I wont fly with Air Canada Rouge again. We paid $100.00 extra for 13A and it was more of preferred seating than Premium Economy. Why use such an old plane for a 7 hour flight to Europe. The seat was so uncomfortable! And they said we had to download the AC app to access videos. It was too late to download once we were onboard. Hated this plane. This was in the premium economy section and cost me about $90 USD as an upgrade over basic coach but was well worth it for 9 hour flight to Toronto from Budapest. Friends flying in coach were miserable. I am 74 inches and 230 lbs but was very comfortable with no leg restrictions. While sold as a preferred seat, this row has compromised legroom due to the bulkhead immediately in front. Im jus under 6 and could not sit with my feet flat on the floor pointing forward. The quality of the seat id terrible - little support and no protection from the passenger behind. 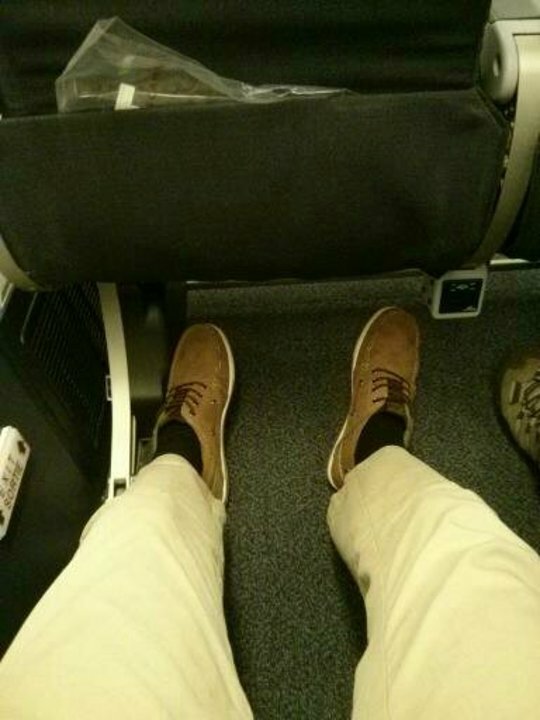 Amazing Leg room! 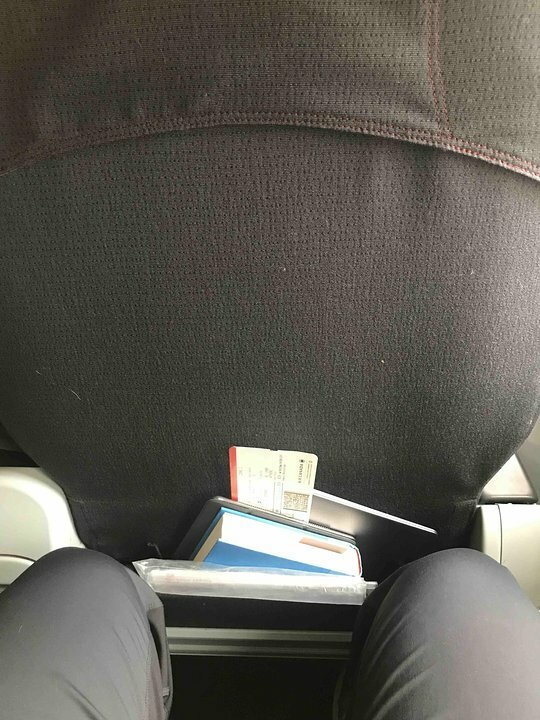 be careful with seat 14A(there's some sort of box underneath)I'm 6.2tall and had plenty of room on both seats, could stretch my arms all the way out to touch the seat in front of me. also loved the service and attention of Rouge. Awful. Sitting in the middle seat with no leg room, a person who reclined in front of me and large people on both sides, I came close to a panic attack. The entertainment system only worked sporadically, and the choice of movies was limited to about 8, none of which were recent, and none of which were good. In addition by the time they got back to our row, almost all the food was gone. Having said that, the fault is ours, since the airlines would not offer crappy product like this if we did not buy it. In my case, having bought tickets at the last minute, I bought very expensive crappy product. I will say that the crew were great. Somehow the Air Canada "we're not happy until you're not happy" attitude has not migrated to Rouge. All of the H (and B seats too) have a huge stantion in the leg room. Avoid at all cost! Paid extra $54 US for this seat on overnight flight. Was freezing cold beside exit door with a draft, and NO extra leg room. Toilets right in front with people in and out all night, deoderant smell and noise overwhelming. Worst seat i have ever had on any airline. Scheduled to fly Rouge--not my choice. According to this site Rouge is the worst ever. I'm advised to take my own food, on-flight entertainment at best sporadic, seats too close to bulkhead--can't straighten legs. So all one can hope for is to arrive on-time and in one piece. So far Rouge sounds like a third-world concept and the flight I'm on is more than 9 hours--head in hands. Say something goo? Cancun-Calgary. Uncomfortable seat with tight leg room. Not "premium" quality. Staff was fine/young. Would absolutely avoid this version of the 767. First time on AC Rouge. Absolutely the worst seat pitch I have ever encountered. It is a flying sardine can. 30 inches is not enough for a normal adult. 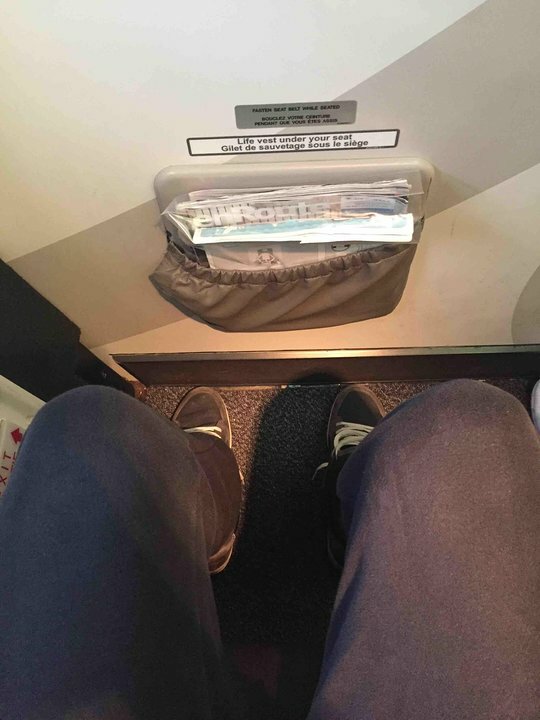 I am 63 tall and had plenty of room for my legs in this seat. It is a bulkhead seat so you cant stretch out. Very near the bathrooms, so there was a lot of activity in the area, but that is my only complaint. I paid $20.00 dollars US for a window seat. Not a WINDOW SEAT. Added a lot of stress to the flight due to no window and a balance issue. Avoid this seat. No leg room. No storage. Frost forms on the inside of the exit door. Extremely cold. Definitely not worth exit row charge. This is a 5 hr red-eye flight. At 6' tall, I found that sleep in this seat was not a serious option, even with a neck pillow. There is minimal knee room, and minimal recline. When the seat in front is reclined, it is not possible to lean forward enough to nap with head on arms. there is a bulkhead, but there is still enough space and you can stretch your left leg to the aisle. I would choose this seat again. Seat has limited access to window. It is located between two windows, beside somewhat wider beam (or whatever it's called). You can see through the windows that belong to rows 20 and 22, but view is partially obstructed. Seat 21A has the same issue. Seats in row 45 and 46 on the right side of the plane(H,K) have no storage above head, because there is some reserved place for disabled people equipment. Beware--- seat diagram is not accurate, extra seating configuration has pushed Bathroom back in front of these seats. 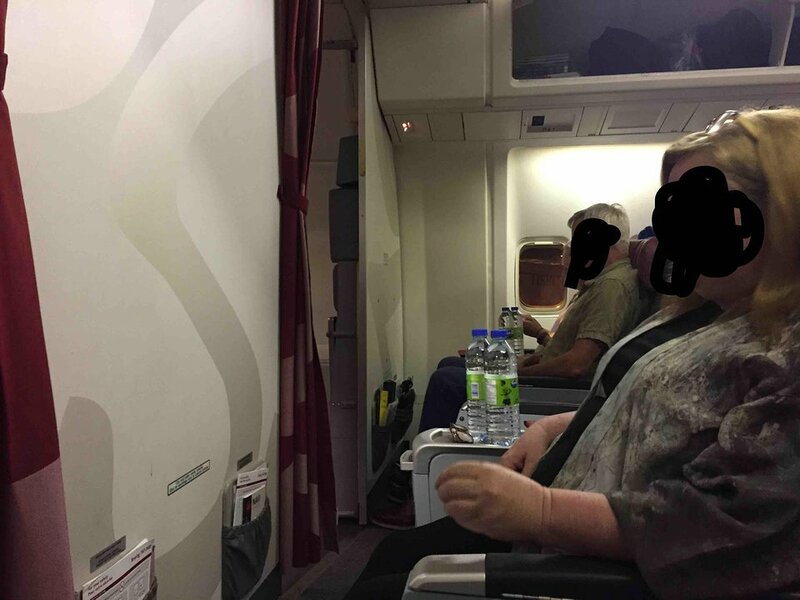 Passengers face a bathroom wall 18 inches away. Reduced leg room, no tv screen, no under seat storage. Freezing cold beside uninsulated escape door. Avoid these two seats! This seat has plenty of leg room. It is somewhat cool because the exit is not well insulated, but it is fine with the provided blanket. Probably 28A is colder. There is no overhead luggage space because it is taken with the life raft; the entire overhead bin space is narrow and therefore it may be hard to fit a US standard roll-aboard, although I managed eventually. All seats in Row 27, on the other hand, were very close to the bulkhead: one cannot straighten one's legs there. There's no overhead storage above Seats 28A, 28B, 28H, 28K, 29A, 29B, 29H, 29K because of cabin safety equipment storage. What bin space that is available is tiny on this old 767. Seats in row 28 are best on this plane, as spacious as in Premium Rouge class which I also flew outbound. The seats A and K are great as adjacent C and H even with missing one seat arm from the exit door side. I am 6.2 heigh and 250lbs and was very comfortable. Save big money of premium if you can get row 28. These seats have no leg room as there is a wall between these seats and Premium Rouge so you can't extend you legs. My legs were bent the whole 9 hour trip so very uncomfortable. Best to go back one more row for good leg room. This entire row is to be avoided at all costs. It is bordering on fraudulent that AC charges extra for this seat as there is no extra legroom given the bulkhead right in front and being right beside the toilet adds to the traffic, odour and lack of anywhere to put your legs. Row 28 has extra room but avoid 27 at all costs. The leg room is not great and it is next to the toilets. I would advise not sitting here. I would pay to move from this seat to another. This seat is bad. This was our return flight and the seats have the most legroom of any seat on the aircraft. It was well worth the extra $100 upgrade per seat. This plane was in pretty bad shape as the restroom had 3 pieces of duck tape holding up the floor. The plane was cold in these seats but better than to stuffy. They did give us blankets and pillows so the blanket was put to good use. I figured I was not the only person on the plane cold so just toughed it out. When we got out I noticed that several blankets were not opened. I asked the flight attendant why. He said these are old Hawaiian airlines planes and people on the front side of the restrooms were to warm. When we got back to LAX our luggage didn't get on our plane and that was another mess however seats in row 28 AC or 28 HK are the best. I was very worried after I made my reservation and then read reviews on SeatGuru and Yelp regarding Rouge. We paid extra for the exit row and it was worth every penny. I was very worried reading reviews that we would not have storage under the seat in front nor in the over head. This flight we had both and the flight was great. This was not the case on the return flight which I will review next. I got nervous reading all the reviews regarding Rouge, I fly internationally a couple times a year, 8hr+ flights. I followed advise I read and paid $100 to 28C.It is a good seat. the attendant did warn me the window shade is broken and to please keep it open, to compensate the brightness, he gave me the business glass pack with nice eye covers, also gave me 3 blankets as he indicated it can get chilly. food, not so good, but I usually pick at it anyway... there was no IPAD's offered as some have mentioned, I didn't bother with the App.Overall not the best flight, not the worst. This sear was horrible. I didn't mind the lack of the window, but the sear was unacceptably cramped. I will NEVER fly Rouge again on one of these aircraft unless I can get a Premiere seat. Also the onboard entertainment system was awful. Limited selection compared with the older system, and so many passengers logging into the network getting into it was like watching molasses run in January. Network capacity woefully under-engineered. Boeing and Air Canada are my last choices for overseas flights now. The small Bombardier jet from Montreal to Ottawa on our final leg had scads more elbow and leg and knee room in the seats. Also the seats on this Rouge flight were incomfortable, passing inadequate for such a lengthy flight. Bombardier sears much more comfortable on any criterion. Long flight Toronto to Athens. This arguably was the best seat on the plane IMO. Reasonable leg roon for this aircraft if you can gwt it. Premiere Rouge seats are manageable but all the other seats on the flight were horribly cramped, see my review of seat s in row 23. Row 23 has no windows. Air Canada only told us about 5 minutes before our flight that we had to download the Air Canada app in order to be able to take advantage of the movies on the flight! This should be in big bold print on the ticket so that we have time to download and activate the app. Not roomy at all. Paid 35$CAD for upgrade. No room in overhead bin as it is used for plane stuff. Don t be fooled, Rouge is nowhere near Air Canada regular quality. 4B & 4F chairs do not recline as much as the others in this class. It is a terrible disappointment. 4D & 4F don't tilt back as far as all the others in this class because the wall behind is too close. You'll be disappointed. 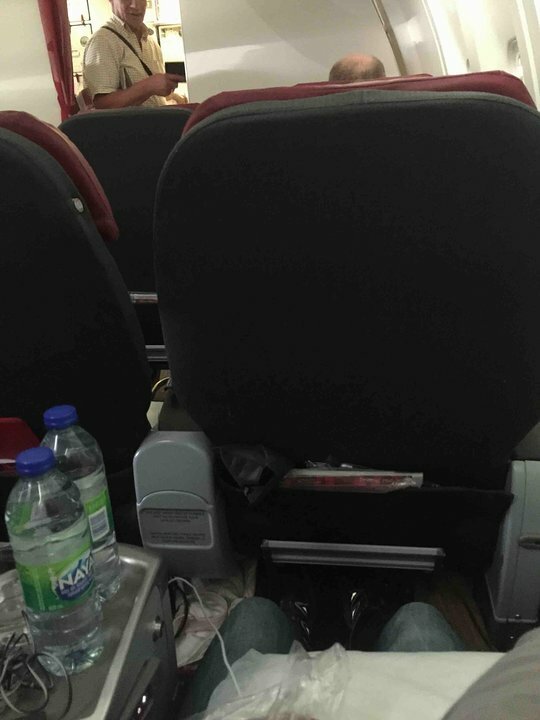 Flew ftom Dublin to Toronto in Premium Rouge. The overall travel experience was better than expected. Cons: plane shows its age, some dirt in hidden spots, no build-in entertainment, the main dish was below average with dry chicken. Also, there was a two hour delay, but this was mostly due to overall crowded Dublin ground traffic. Pros: You get adequate space for a premium economy seat, well suited for a 7 hrs daytime flight. Service was frequent and friendly. Also, on this flight the interior already was the slightly modernized one, so the overhead bins easily accomodated the hand luggage. Flight AC 1966 from Toronto to Berlin in Economy. Aircraft registration was C-FIYE. This was my first experience flying Air Canada Rouge and overall it was good. The legroom is a little tighter and the seats a little less comfortable than Air Canada's mainline product but my family of six had no major complaints. An earlier review mentioned no windows in this area of the aircraft so just to confirm this row does have windows on either side. The food was just OK, the in-flight entertainment was responsive and worked well and the flight attendants were good. NOT worth paying extra for seats in this row - bulkhead limits legroom severely. Row 28 a MUCH better option. This is disgusting. 10 hours to Athens, air canada should be ashamed of themselves. This is not a premium product in any sense. I have had more legroom on low cost carriers. As a loyal Air Canada flyer this has forced my hand and i will be using ANY other option to fly to europe from now on. Worst service and flight experience I have had in 60 years of air travel. I am a pilot too. My wife does not ever want to fly with Air Canada again - ever !! Fantastic seat. Was so worth paying a little extra so my girlfriend and I could fly in comfort. Plus right next to the lavatories so that was a plus and just love the comfort of this widebody jet over the rest in this fleet. This is simply the worst possible seat, no room to spread your legs, limites recline, almost sitting in the restroom plus Air Canada charge you extra for it. This is an economy seat. No complaints its obviously a low cost airline so i don't expect much. Foot space was decent I'm 5"8. Storage under the seat was limited. The window seat where my sister was seated had room to put a bag under the seat but the aisle didn't. The rows are also not aligned. This was a business class seat. The food was horrible. Obviously Air Canada (Rouge) does not care for their passengers when you feed them such horrible meals. Will not fly with Air Canada again if I can help it. I took this flight home on feb 6 2017. We flew united from toronto to hawaii and booked Air Canada Ac 1822 for the flight home. To compare the two airlines i would have to pick Air canada. The seat I had 15 E was a good seat. Roomy leg room, could have used more pitch but all in all it was a good flight and awesome pilots and flight attendents. Edinburgh to Toronto in Premium Economy. No under-seat storage but ample room in overhead bin.Lots of leg room with bulkhead in front.Boarding and Baggage check a breeze. Attendants were great and attentive. Food ok considering it is airline food. Player provided. Would definitely fly air rouge again. Seat guru calls this an economy seat but it is actually Rouge Plus and I paid an extra $100 to sit in the worst seat ever. No indication of bulkhead/toilets when booking. Ice cold air from ancient emergency exit door. Constant accidental pinging noise for nearby flight attendants. No room in front or above for carry-on. And worst of all - no room to stretch out legs which was the promise of the "Premium" seating. See the pictures posted by Mitchell G. in 2015. Or the complaint from 2014/10/12. AC is doing nothing to stop this misleading seat premium seat designation. Avoid these seats and take row 28 instead if you need lots of extra leg room. AC offered me a 10% discount on my next flight but would not refund me for the misleading and "non-refundable" premium seat charge. First time flying with Air Canada Rouge and I think last (flight MAN-YYZ). -Seat uncomfortable and small pitch even for me (5'8"), really couldn't get comfortable. - Food and drinks very limited and mediocre (and no free alcohol). - Staff, some looked scruffy and rushing things. - In-flight entertainment system absent and limited to wireless streaming to your device or for $10 you can hire an Ipad but in either case the device will be in your way during meals. Overall poor service and if I can I will avoid flying Air Canada Rouge again. Row 26 seats D,E and F are not reclining. Overhead bins are occupied for a storage of on-board equipment. Seats do not recline. Very close to toilets. Limited leg room. Avoid these seats! I was offered these seats at the gate as an upgrade as they are apparently preferred seats!?! You are in an emergency exit up against a bulkhead and right outside the toilets in seats that only partially recline. My worst trans-atlantic flying experience ever. I would absolutely spend the money and upgrade to these seats again. My husband and I flew Rogue to Barcelona from Toronto, and I had read the reviews, so I knew to upgrade our seats to these seats. I will agree with previous posters that the bathroom light can be bothersome, and to make sure you dress warm, as it can get cold, but I thought the seats were actually quite good for what we paid. My husband is 6'6" and actually had a lot of legroom. I would fly Rogue again, as the service was great, and I like that it only cost us $140USD total to upgrade to these seats. We used Air Canada Rouge for the first time and, I have to say, it will be the last. The flight was Vancouver to Honolulu and the seat was very uncomfortable with little padding. I have flown AC before but this move to Rouge seems to be a downgrade. Westjet next time! Having had a bad experience flying rouge before, I was expecting to be disappointed with the service and amenities once again. This crew was very courteous and professional. The rouge player app worked better than previously and streaming was no problem. The seat was comfortable enough for the 3-hour Toronto-Fort Lauderdale flight, but I would not want any of these economy seats on a longer international flight. Overall, the trip was much better than on the A319 I previously flew on, but I would not recommend this plane for trips over 4 hours. Just took this flight from Honolulu to Toronto. These seats, designated as window seats, have no windows, just a solid wall. The seats are terrible and so close together. If the passenger in front of you reclined their seat you would not be able to read a book or set up your I-Pad. There was no service other than juice after take off and water every couple of hours. They couldn't serve a soda or prepared snack for a 9 hour flight because they claimed turbulence. It was not that bad. On our outbound flight we upgraded to Premium Rouge. That was fine. Perfect seat with space for your legs. The misaligned window is not really misaligned. This is certainly the best seat in the airplane. Complete garbage bin of an airline with dirty old plane and only good service to rescue it. I got upgraded from their economy product to Premium Rouge due to my Aeroplan status, which I was happy about, but seat 4A really can't recline much because it is the last row in the class. This very much feels like an average economy seat in any other airline, but what makes it worse is that there is no personal system to control airflow AND the planes are old and not well maintained. The seat in front of me had very bad stains all over the ugly leather, and my window cover was not much different. The complimentary meal offered was nothing to write home about and the complimentary iPad to watch movies had a nice selection, and that's about it. For safety, it had to be collected 30 minutes before landing. Only the young Rouge staff were friendly and courteous. At six-feet, the legroom is a little tight, especially with a small bag at my feet. It will be my first and last time on Rouge though as my three-hour flight from Orlando to Toronto had no wifi, no entertainment system (unless you used your own device), no complimentary snacks, and this aircraft features no overhead personal air jets to cool myself down in the stuffy cabin. Air Canada Rouge is a complete disaster. I paid Premium Rouge fare (nb Business Class fare) for the worst flight i have had in 30 years. No leg room at all my feet and knees jammed against the bulkhead and kept falling asleep. I had to sit upright for over 6 hours through the middle of the night. Never fly AC Rouge, it is a Rogue airline. This is Premium Rouge, so I cannot speak to the other classes of service. My flight was from YYZ-LAS, so not a tremendously long haul, and I would not fly this seat on anything longer than 4.5 hours. For North America, it is within [although slightly lower than some - UA and AA have some nice new first and business seats - roomier] the standards of most business class seats. For international travel, this would be slightly [ever-so] than a premium economy seat on most other int'l carriers. There is NO WAY to lay flat or nearly flat, so a long-haul would be very uncomfortable if you suspected you were getting something like business class - it's not. Not even close. Service is nice, but amenities are non-existent. After looking at pics of the plane, I called AC Customer service after our seats were booked, to confirm there was actually a window. She said all their seats had a window. As an avgeek, I was very disappointed to see my view was a wall, between the window in row 22, and behind us in row 24. Also, I was worried about legroom, as I am 5'10". For me, if i sat us straight, I was fine. My 6'3" son had to have his legs to the side though. We were happy to see USB ports to plug in our iPads on the flight home though, as I read there were none. All seats on this aircraft should be labeled as "Bad seat". No seat on this aircraft, including Premium Rouge has any leg room nor are the seats comfortable. No entertainment system, bad food and a low level of service definitely makes this a 'low cost carrier'. The travel industry needs to remember that Rouge is part of Air Canada when they are voting for North America's 'Best International Airline'. I was pleasantlu surprised by the comfort of the seats and the service received on my first trip by Rouge. Plenty of legroom in premium economy and a comfortable seat for a six hour flight. I am seriously considering changing my Premium Rouge flight to Osaka to premium economy. The wall is in front of you, which may be an issue if you have long legs as you can not stretch out. Row 28AC 28HK are much better. Terribly outdated, awful aircraft. I can't wrap my head around it. Luckily, premium economy section was nowhere near full, so I had nobody beside me. No entertainment, the Rouge stream-to-device system does not work with macs, so I was pretty disappointed. Had I not upgraded to Premium economy, the 30" pitch would have been unbearable. Avoid this plane if possible for long-haul flights. It's awful! pick seats near the exits, but not too close to the bathrooms. Seats are pretty comfy, and flight attendants are friendly and willing to help. Wish they had in-flight entertainment, iPad and laptop system was flawed and buffered frequently. Overall, a great flight, except for the fact that baggage fees for bicycles were steep, compared to friends that payed nothing for bikes on WestJet. Terrible seats! Despite the fact it's supposed to be business, you do not get any legroom in these bulkhead seats! No underseat storage and of course with Rouge a very poor entertajnment system ( old movies, no choice) . What an insult for montreal travelers for Vegas flights. Oh, and we have to stay close to an hour on the ground because a part of the plane was broken during pushing back! Lots of legspace. Perfect. Was on connecting flight from Europe booked with Air Canada. As first flight was wis Swiss I was told to do online check-in through Swiss. As I did so I figures out that I could get this seat without surcharge. Great legroom for this seat. Probably more than in premium rouge. Armrest on left side is a makeshift and is only half an armrest. So not very comfortable but the extra recline and legroom makes it a great seat. Probably one the best in economy. A new low for Air Canada! Premium Rouge seats are not worth half the peice. Cramped and with nothing more than a bus-like foot rest that is attached to seat in front of you. Useless as it is not adjustable at all. No comfort value in this aircraft. I am an elite member but have switched to Westjet forever to Maui. In addition to the previous comments about general lack of comfort in Rouge seats, I need to add that this seat is very cold. it seems that the emergency exit doors directly ahead make the cabin walls cold. this made my flight to Maui almost unbearable. Also, the overhead bin for this row is taken up by the life raft! Passengers in row 29 need to look elsewhere to stow bags. Seats 12A and C on the way back from Honolulu were surprisingly not as comfortable as seats 12 D E and F, mainly due to proximity of vent blowing cold air. Slimline design seats are fine. Executive class is classless. Seats very uncomfortable. Changed return flight from rouge premium to west jet coach. Although I have a flight pass to Honolulu I will be looking for alternate arrangements in the future. Rouge is a joke. I'm a super elite, million mile member. 20 year old crew (not 20 years of service), no clue what they are doing. The plane is a new but designed to pack in the revenue. Don't bother get premium rouge, rouge plus is almost exactly the same minus the meal at half to a third of the price. It's free for certain aeroplan members. it`s a JOKE !!! the seats are not confortable at all, it`s the worst airline ever... I WOULD NOT FLIGHT ON ROUGE ANYMORE ! I`m an elite member of air canada, I don`t understand why they do low cost !! Terrible seats avoid at all cost. Right beside the washrooms,cold draught from the emergency door, constant ding noise due to the call buttons being positioned at hip level in the seat making it too easy to set off, ie move against it at all and it dings, this is from all the seats and the sounder is at row 27,not good. Food rubbish ,will avoid rouge flights in future, we flew from Toronto to Dublin. Air canada rouge is terrible. We often travel to vegas and this is the only choice we have if we want to travel with them. I don't know what precipitated this change as it is definitely a step down from regularly scheduled air Canada flights and is especially noticeable when you want to fly business class. This is not the kind of first/business class seat you find on other carriers. The seats look like the old business seats AC used about 10+ years ago - similar configuration. Air Canada has stepped backward with its Rouge flights. We choose to fly business class and are frustrated when not offered on most routes out of Toronto. Rouge premium economy is nothing more than flying basic economy......everything about it is substandard. Looking for anither carrier to be faithful to. Rouge Premium is a joke. The foot rests fold supposedly into your seat but they protrude just enough to be a nuisance, rubbing constantly against the calf. When extended its virtually impossible to exit the seat. Baggage storage under the seats in front (Row 1) is limited by an obstruction under Row 1. The lunch itself was very good but the seat tray (2H)had to be held to keep it from sliding around. Our observation is Row 1 seats AC and HK have lots of leg room but we observed discomfort as well with that fold-away footrest as we did. Just 1 washroom located on the forward left side beyond the curtain. Overall, Rouge Premium is wildly over-advertised by Air Canada. The comments are accurate. This is not a tall person friendly row. Overhead bulkhead is very low. Ours was full of 1st class blankets. No room for our carry-on. and no room on the floor. seats are very narrow/tight. Even with the added recline, for someone 6'1" they are very uncomfortable. Great crew. Air Canada flies 2 versions of Boeing 767-300ER (763).